In Star Trek when one is transported, does it feel instantaneous regardless of if there is a need to store the person's pattern in the pattern buffer for any length of time? Is the sensation of transport instantaneous regardless of length of time between dematerialization and rematerialization? NOTE: This answer is probably going to have to come from the expanded Star Trek media (prose novels, comics, etc.) as we don't really get a first person perspective from the shows/movies during transportation. Yes, while transporting you have no perception of time. This is why Scotty still thought Kirk came to rescue him when he actually spent 75 years in the transporter buffer. RIKER: I'm Commander William Riker, starship Enterprise. Lieutenant Commander Geordi La Forge. SCOTT: The Enterprise? I should have known. I bet Jim Kirk himself hauled the old girl out of mothballs to come looking for me. Captain Montgomery Scott. Tell me, how long have I been missing? In that episode, Barcley finds some of the survivors of the USS Yosemite "parked" in the transporter in a similar way Scotty saved himself 75 years before. Not the answer you're looking for? Browse other questions tagged star-trek star-trek-tng star-trek-voyager star-trek-ds9 star-trek-transporter or ask your own question. 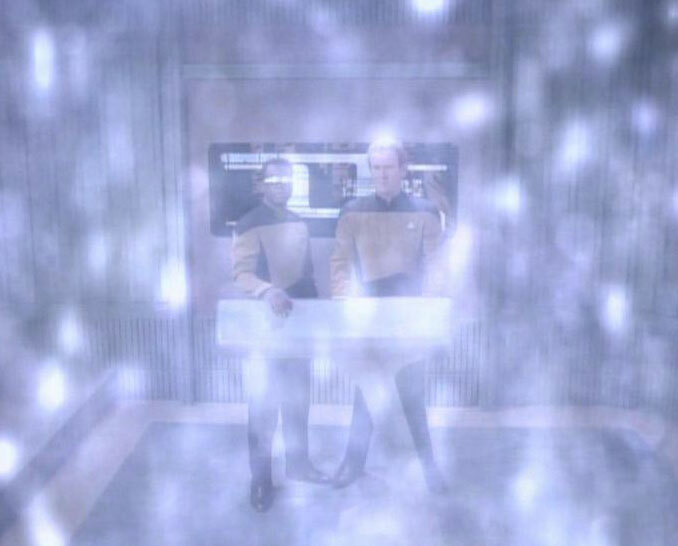 When does a person's sense of self arrive when beamed? Do ships at warp experience time dilation? What would be the crew complement of an Excelsior Class star-ship closer to the time of the Dominion War? What does the passage of time “feel like” on Kelemane's planet?